As translators often like to get sucked into Wikipedia or other world-knowledge-accumulating online resources, they do not need a hefty reason for it. The time of the year will do. And as we all know, the darkest time of the year on the northern hemisphere brings along a chance to catch a glimpse of Santa’s minions, the Christmas elves. And, boy, do these guys have an interesting history! The following is a summary of my brief dip, turned several hours, into the Nordic terminology of the stalking yet helpful, tiny yet powerful bearded creatures, and to the concept of what is now known as Santa Claus. For a long time, the folks in Sweden, Norway, Denmark and Finland have lived with little fellows coined tomte, nisse and tonttu. Back in the day, these guys used to inhabit farms with the farmers and keep an eye on the farm dwellers’ behaviour. The hobs displayed temperament and powers sufficient to guard the farm workers’ work ethics. 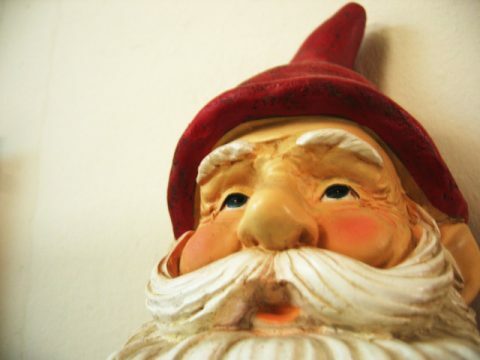 The Swedish name tomte is allegedly derived from tomt, a plot of land. Why? The gnome of the farm was apparently seen as an embodiment of the spirit of the original farmer who had cleared the plot. With the equivalent Finnish words being tonttu and tontti, the Swedish motivation for the term also makes perfect sense to Finns. As for nisse, encountered in Denmark and Norway, it is an interesting question whether the name has its roots in nixie, a shape-shifting water spirit (näkki in Finnish). The term nisse is also in use in Finnish. In the Christmas song Nissen polkka, the term most likely refers to a farm hob. Kielitoimiston sanakirja (The Dictionary of the Finnish Language Office) includes two definitions for nisse: a young assistant waiter in a restaurant or a gingerbread man. Later, brownies took over the Christmas gift delivery duties in households, and — fused with the English 16th-century Father Christmas tradition that swept over the Nordic Countries — yielded the job titles jultomte, julenisse and joulutonttu. Due to this blending, the Swedish term jultomte appears to be reserved for Santa Claus, while the members of his staff go by the name tomtenisse. The new distributor of presents eventually replaced the Yule Goat, which was known as julbock in Sweden and must have done a pretty bad job, as a giant straw figure of a goat, erected on the first Sunday of Advent, is burned down in Gävle every year. In Finnish, a mirroring term joulupukki is still in use, but it refers to Santa Claus himself. Speaking of gift giving — Santa Claus, elves and goats were preceded by Saint Nicholas, a 4th-century Greek bishop living in the part of the Roman Empire which is now known as Anatolia, the Asian part of Turkey. He became known for his knack for spreading joy in parcels large and small. He is merited as the prototype after which Sinterklaas and, ultimately, the present-day Santa were modelled. The concept of this enlightened Christmas chap is a remarkable example of conceptual blending that integrates layers of several cultures, traditions and terms, all contributing new properties to the mix — a mix that continues to confuse adults and fool children. This whirlpool of a concept that is Santa Claus keeps on absorbing new structure as people elaborate on the concept. St. Nicholas probably never saw a reindeer in his life and farm brownies were allegedly only under a metre tall, but we have no problem with Santa arriving on a flying sled and entering through the chimney in some cultures — despite his waistline now equalling the length of a few elves. It should be stressed that the collection of terms and traditions covered in this piece of bloggery is by no means exhaustive and that the sources referred to during its drafting were Wikipedia and Kielitoimiston sanakirja (on-line version). For more on conceptual blending, see The Way We Think: Conceptual Blending and the Mind’s Hidden Complexities by Gilles Fauconnier and Mark Turner (2002). If you wish to share your knowledge related to these Christmas traditions in your native country, feel free to leave a comment. Regardless of whether you believe in Santa Claus or not, have a merry Christmastide, or happy holidays, as they say.